Czech Republic is a land that has history dating back as far as 870 AD. It’s an old place with old buildings and things, but the one thing that impresses me about Czechs is how they clean they can keep things. For the most part I find that they like their houses very tidy, clean, and well kept. This would include the yards too. Our landlord is no exception. Just the other day, we saw a cleaning lady out in the driveway meticulously sweeping the bricks and with a pickaxe she was scraping in between each individual brick removing dirt and moss! Today our landlord left a note about the window sills on our place needing to be cleaned. Amazingly, Bethany actually had that on her list of things to do and had started on one side of the house today. 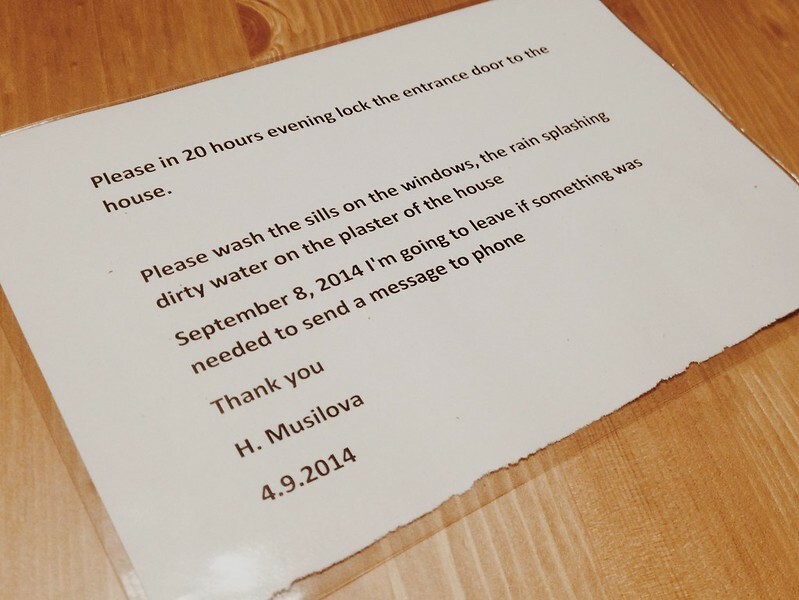 She was halfway through cleaning them when she found the note on our doorstep (shown above). I’m positive our landlord using Google Translate to write us and it’s just funny how they sound. Bethany told me later that she took a photo of the window sills because she wanted people to see just how large they are (photo below). You can practically sit on them like a bench and they are definitely a chore to clean. I don’t think I’ve ever really seen anything like them in the States, but we’re happy to make sure they look nice. My teammate John and I went to a little restaurant near the Josiah Venture offices today for lunch. Its a great little place that I’ve shared about before and we like it because for $4 you can get hot soup and a lunch entree. Only one time have I ordered anything but pizza there because I think it’s amazing. As we were doing our best to translate the menu today the waiter came over to us and motioned with his arm like a chicken. He was trying to tell us that the third item on the menu was chicken wing, but for some reason I was said, “Chicken breast?” and he nodded and smiled in affirmation. I don’t know what I was thinking and I definitely don’t think he understood me. A few minutes later he came over and in broken English said, “chicken?….” and was motioning with his arm like a chicken. Then I heard the words, “chicken breast?” come out of my mouth again and he got excited and ran over to another table and told them “Chicken breast.” There were some other native English speakers at a nearby table (which is rare) and our waiter was excited to speak English to him, I guess. Nevertheless I felt like a failure but his one-armed chicken wing motion still makes me giggle. Speaking of chicken, Bethany made amazing chicken and dumplings tonight. She was really excited that she was able to get all of the ingredients at the store by herself and the meal was wonderful. 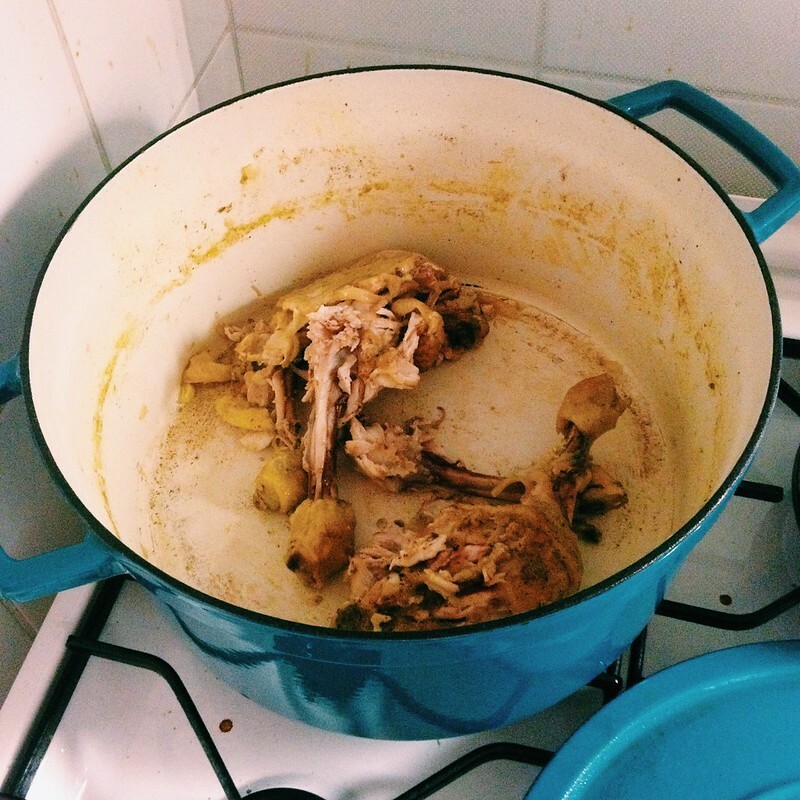 Now she’s in the kitchen reading on how to make her own chicken stock! She tells me those are her chicken stock ingredients in the above photo. This girl has gone true Pioneer Woman and I like it! Watching Bethany adapt here is actually really fun and I think she’s risen to the occasion of being a foreign missionary, engaging newer things with a willing and able attitude. Tomorrow is another early day for me but I’m hoping to spend the latter half of the day with Bethany and the kids as I’ve been plowing pretty hard this week with projects for Josiah Venture. God has been gracious with our health and energy during some busy days. Praise the Lord for how He continues to show his kindness to me and my family.